After J.J. Thomson's discovered the electron in 1897, it became clear that atoms were not the smallest building blocks of nature, but rather were composite particles. The newly discovered structure within atoms tempted many to imagine what the atoms structure might look like. The newly discovered structure within atoms tempted many to imagine how the atom's constituent parts might interact with each other. Thomson theorized that multiple electrons revolved in orbit-like rings within a positively charged jelly-like substance. 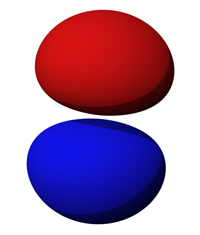 This theory known as the "plum pudding model" was the most widely accepted explanation of atomic structure until 1909. In 1904, the Japanese physicist Omura Nagaoka developed an early planetary model -- The Saturnian Model of the atom--. Nagaoka's model was based around an analogy to the explanation of the stability of the Saturn rings (the rings are stable because the planet they orbit is very massive). The model made two predictions: a very massive nucleus (in analogy to a very massive planet) electrons revolving around the nucleus, bound by electrostatic forces (in analogy to the rings revolving around Saturn, bound by gravitational forces). In 1909 Ernest Rutherford discovered that the positive half of atoms was tightly condensed into a nucleus, and it became clear from his analysis in 1911 that the plum pudding model could not explain atomic structure. Shortly after, in 1913, Rutherford's postdoctoral student Niels Bohr proposed a new model of the atom, wherein electrons orbited the nucleus with classical periods, but were only permitted to have discrete values of angular momentum, quantized in units h/2p. This constraint automatically permitted only certain values of electron energies. The Bohr model of the atom fixed the problem of energy loss from radiation from a ground state (by declaring that there was no state below this), and more importantly explained the origin of spectral lines. The Bohr model however could not explain much of the spectra of larger atoms. With de Broglie's suggested the existence of electron matter waves in 1924, and Heisenberg's discovery of his uncertainty relation,Max Born suggested that the electron's position needed to be described by a probability distribution which was connected with finding the electron at some point in the wave-function which described its associated wave packet. The new quantum mechanics did not give exact results, but only the probabilities for the occurrence of a variety of possible such results. Heisenberg held that the path of a moving particle has no meaning if we cannot observe it, as we cannot with electrons in an atom. In the quantum picture of Heisenberg, Schrödinger and others, the Bohr atom number n for each orbital became known as an n-sphere in a three dimensional atom and was pictured as the mean energy of the probability cloud of the electron's wave packet which surrounded the atom. Atomic orbitals are the places surrounding the nucleus of an atom where the electrons are most likely to be at any given time. It used to be believed that electrons behaved similarly to the solar system, where the sun is the nucleus and the planets are like the electrons. 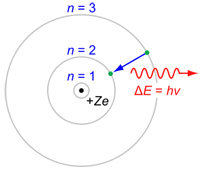 However, electrons do not go in circles, they move erratically. 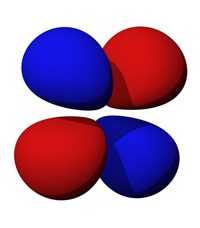 The number of atomic orbitals in an element is defined by the period the element is in. Electrons move between orbitals depending on how fast they are moving and how many other electrons there are. The atomic orbitals of the hydrogen atom can be visualized as a cloud around the nucleus. The orbital represents a probability of finding the electron at a particular location. Regions that have a higher concentration of dots signify a greater probablility. 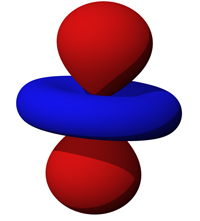 Atomic orbitals do not always have the shape of a sphere. Higher orbitals have very unusual shapes. The pdb coordinates used for the Jmol files were retrieved from: 3-D Graphic Examples of Atomic Orbitals, where you can find additional examples.